Ten new designer names you're going to want to know if you don't already. The CFDA Incubator -- a program through which young designers are granted affordable studio space and invaluable mentoring for about two years -- has helped springboard some major careers, from Prabal Gurung to Public School to recently-announced Ecco Domani winner Timo Weiland. And Tuesday, as the second group of hatchlings prepares leave the nest, the CFDA has announced the third lucky group. Among the list of 10 fledgling labels are a few we love and know well -- Katie Ermilio, Kaelen, Nonoo -- and a few we&apos;d better start getting to know. The CFDA has high standards for the business development program -- to be eligible, designers must have already demonstrated their potential through editorial placements and orders from top retailers. And the point of the program is to give designers the tools they need for a sustainable business, all the while connecting them with some pretty important people in the biz. Read on to learn about all 10. Accessories brand A Peace Treaty aims to be transparent and ethical while increasing awareness of ancient crafting traditions. They employ artisans in areas of socio-political strife in countries like Pakistan, India, Nepal, Turkey, Afghanistan, Bolivia, Peru and Ecuador. The label&apos;s jewelry, scarves and caftans are not only super cool and special (very Jessa -- and, unsurprisingly, the line has been featured on "Girls"), but they also help people! Former stylist Sara Beltran left New York for Jaipur in northern India, where she launched a jewelry line inspired by beach life. Much of her jewelry is made from molds of shells she finds on various beaches around the world, cast in 18k gold. Tapia makes cool, innovative-yet-not-overtly-trendy footwear in the $300-$600 range. She&apos;s like a less expensive, quieter Charlotte Olympia. Haworth launched her namesake womenswear label just nine months after graduating from Parsons. Her designs are all very "cool," but accessible and simple enough to wear every day. She&apos;s pretty cool, too. As in: she recently did a Coachella-inspired capsule collection in collaboration with Hannah Bronfman-cool. Parsons grad and former Gap accessories designer Law launched her cool, minimalist handbag line Kara in 2012 and has already been picked up Creatures of Comfort, Harvey Nichols and Opening Ceremony. We&apos;ve been coveting her sleek, black leather backpack for a while now. We&apos;ve been obsessed with Ermilio&apos;s crazy-gorgeous, brilliantly tailored cocktail and eveningwear since the designer, whose grandfather dressed Grace Kelly, left her job at Teen Vogue to take her made-to-measure side business full-time. She&apos;s been an insider favorite for a while now, so hopefully this brings her the outside exposure she deserves. Another company dedicated to transparency, Lucio Castro, uses organic Japanese fabrics and manufactures his menswear pieces in Sri Lanka, Argentina, and fair trade organizations in India, Nepal, Ecuador and Tagua. Castro went to Parsons, designed menswear for Marc Jacobs for a while, worked in film for a few years, then returned to fashion with this namesake line. Fashion girls started making a fuss over Flinn&apos;s awesomely pared-back, sleek designs a few years ago and she&apos;s never quite broken out of that &apos;up-and-comer&apos; bracket. But we know she can. Nonoo is one of those labels that just keeps getting better and better with every season. 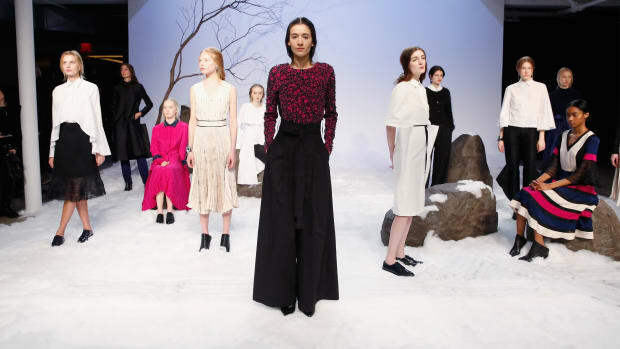 The super-pretty designer, who was a CFDA/Vogue Fashion Fund nominee last year, has lived in Bahrain, London and Paris (and now New York), and those multicultural influences can be seen in her elegant womenswear collections. We&apos;ll be watching her closely -- very closely, in fact, as we share an office building. This buzzy New York-based men&apos;s knitwear brand launched in 2012 by two brothers and one of their fiancé&apos;s is rooted in craftsmanship (everything&apos;s made in Italy) but maintains a sense of humor. It already has that buzzy, too-cool-for-school air that so few brands are able to attain. The menswear designer tells us about how he got into stores like Opening Ceremony and Saks and his plans for a womenswear line.